An online intercept is a tool for inviting visitors on a website to participate in research. 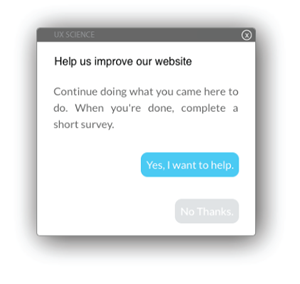 These tools appear in many forms, but one of the most effective designs displays a modal on top of the webpage (see image) and provides clear options to accept or decline an offer to participate. Read below to see why you should purchase the online intercept we designed. There are significant benefits to using an online intercept to conduct your research. Recruiting costs are high when targeting a specific audience. An online intercept effectively collects feedback from your target audience as you intercept them while they visit your website. The intercept can be used to recruit participants for many types of research. For example, you can easily conduct true intent studies, information architecture studies, and general surveys. You can even collect contact information for future remote usability tests. 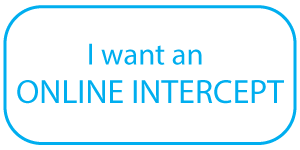 Click here to learn more about how to use an online intercept to conduct true intent studies. Many online research companies (i.e., Qualtrics, UserZoom, Loop11, etc.) provide intercept features with their services. However, it’s difficult to aquire a stand alone intercept without paying for these services. With the increase of cheap or free online research tools, such as Google Forms, Cognito Forms, etc., a stand alone intercept is the key to conducting online research at a low cost. Also, many UX researchers use multiple online research tools, and thereby use multiple intercepts differing in look and feel. However, it’s better to have one consistent intercept invitation across your site. As mentioned previously, it’s difficult to find an online intercept without subscribing to a service. Therefore, to access the power of an online intercept without paying the high cost, you can develop it yourself or use the one we created.